Today I read some news concerning A-EON Technology and AmigaOS 4. Thought I’d share it with you. 🙂 Please read on for the full press release! 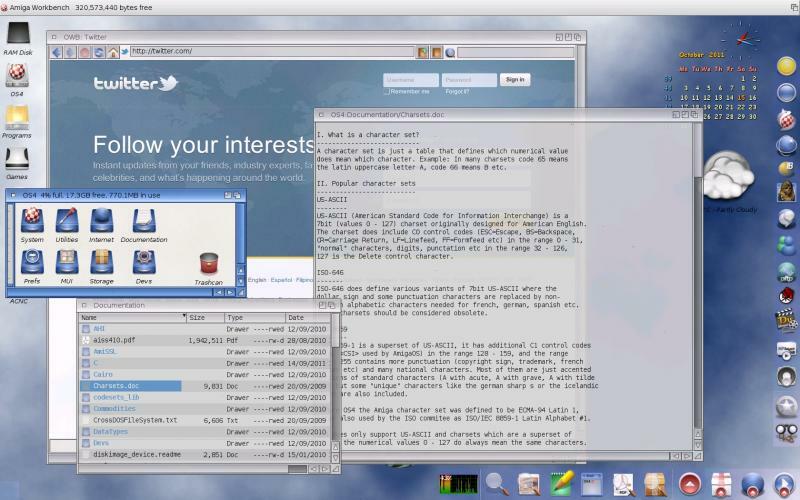 Trevor Dickinson commented, “This is a major boost for the AmigaOS and is the first time that these modern graphics cards have been supported on non x86 systems. Hans has already released several updates to his RadeonHD driver and support for Evergreen and Northern Islands cards is already up to the standard of the R700 drivers released with the AmigaONE X1000. He has also made excellent progress with drivers for AMD’s Southern Islands cards. Hans de Ruiter replied, “I was initially disappointed when supply of Radeon HD 4000 series became scarce but now I’m proud of what has been achieved. The RadeonHD driver once again supports some of the latest cards available.” His comments were echoed by a long time AmigaOS 4 developer and A1-X1000 beta tester who stated, “Looks like OS4 won’t have to worry about availability of compatible graphics cards anytime soon”. We can only agree. Although the RadeonHD driver is exclusively licensed to A-EON Technology for AmigaOS 4, owners of ACube’s “Next Generation Amiga” systems need not despair. They will be able to purchase RadeonHD driver updates via the A-EON Technology website for their Sam460 and AmigaOne 500 systems. AmigaKit will also be offering RadeonHD graphics cards and driver bundles. Please visit the AmigaKit website for more details. Customers who purchase the new driver will qualify for free upgrades, up to and including version 1.0 of the RadeonHD driver. Registered AmigaONE X1000 “First Contact” customers will be able download driver updates free of charge from the A-EON Technology website. About Hans de Ruiter & HDRLab: Hans de Ruiter is an electrical & electronic engineer and leading AmigaOS developer and Amiga enthusiast. His website – HDRLab – details various projects, many of which are AmigaOS related. The biggest of these is the RadeonHD driver for AmigaOS, an ambitious project that aims to deliver modern graphics capabilities for the AmigaOS platform. About AmigaOS: The AmigaOS dates back to 1985 with the introduction of the landmark Amiga 1000. Today, under the guidance and control of Hyperion Entertainment, AmigaOS has evolved into a modern operating system without losing that intrinsic “Amiga” look and feel. About the AmigaONE X1000: The AmigaONE X1000 is not like other computers. It is a culmination of efforts by real Amiga enthusiasts and developers to create powerful, modern desktop hardware for the AmigaOS. It is the natural evolution of the Amiga’s PowerPC lineage and is based on the PA-Semi Dual-core PA6T-1682M CPU and includes Xena, a “Software Defined Silicon” co-processor. Above all it runs the latest version of the AmigaOS. AboutAmigaKit: AmigaKit is a trading division of Leaman Computing Ltd based in Cardiff, UK. It acquired the stock of Eyetech Group Ltd in 2006 and quickly established itself as a world-wide market leader in the retail and distribution of Amiga hardware and software. A-EON Technology appointed AmigaKit as its primary distributor for all its AmigaONE products. A lot of discussions on all the Amiga forums about this.Paying for for drivers…. But looking a bit further in to this it does make some sense. I’ve noticed that there are quite a lot of discussions concerning this. As far as I’ve understood, the drivers are free for AmigaOne X1000 users, but the rest have to pay. I don’t think it’s necessarily bad either. Hans is doing a great job on this. Correct. We will see how this plays out. We’ll sure do. I now read that ACube is offering the driver for free to new customers of AmigaOne 500 and Sam460X. I read that as well. Great decision they made on this. Agree. 🙂 ACube rocks. They deserve a lot of credit for all of the hard work they’ve put into the Amiga during the last years.